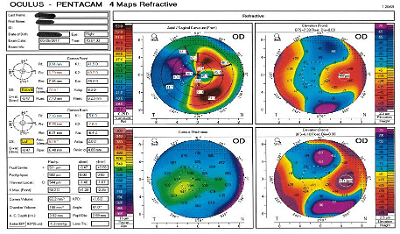 Patient MA, a 51 year old male construction director was diagnosed with Keratoconus at age 13. He was referred to the NHS Hospital Eye Service and underwent a corneal graft in his RE in 1991, and was discharged 3-4 years later. Was wearing soft monthly toric CLs, however he had noticed a gradual deterioration in vision with CLs over the last 1-2 years. He was seeking a vision correction solution. After a thorough investigation, with plenty of diagnostic scans and tests, the following treatment plan was agreed. Both surgeries were to be performed on the left eye, followed by both on the right eye. In this particular case, it was important to counsel the patient thoroughly and ensure his expectations were realistic. The reason for carrying out two procedures was due to the unpredictability of lens calculations on a keratoconic patient. Naturally this patient was not suitable trifocal IOLs due to his irregular cornea which would induce even more distortions, halo’s, glare, etc. As can be seen, the patient achieved excellent binocular vision. More importantly, for this patient, his vision was stable and he was able to function on a daily basis with only ready readers. Keratoconic patients are able to undergo multiple treatments to rehabilitate their vision as long as they are realistic about their expectations.